Trust me I work there, the trains are Vekoma trains. On the seats imbedded in the back it says in large letters, "Vekoma"
Whirlwind at Knoebels is a Vekoma track, Arrow train coaster. So, it's entirely possible. The word "definitely" is definitely the most misspelled word on the buzz. I I think Iremeber it saying Arrow on the back not Vekoma and I am 100 percent positive it says Arrow on the wheels. Many Vekoma Boomerangs have Arrow trains. Trust me, I work in that section. I rode THIS WEEKEND and looked at the trains and thought to myself, "HAHA it says Vekoma plainly on the seats-thats bad advertising on this ride"
I rode it last Saturday and it says Arrow on the wheels trust me. No, chris is right, chris this is chris, i remember riding with you the other weekend and we clearly pointed out VEKOMA on the seats. Unless they just supplied some backing to these seats these are clearly vekoma trains. I do wonder if they were made back when Arrow produced the steel and such and maybe they supplied the wheel bearings and wheels. But, the seats are clearly marked with the word vekoma. You gotta remember, this is Six Flags, if we can buy wheels that are the same size cheaper from Arrow than Vekoma, then by all means we will, but the trains themselves are Vekoma...Its hard to beat someone in an arguing contest that goes to the park every single day its open just about. Ninja is my next door neighbor while im at work. Its in my section and I pride myself with knowing alot about the rides in my section. I know that every single seat in that ride clearly is marked with the words "VEKOMA"
I have heard many many times the trains are Arrow and the track Vekoma. Doesn't seem to me that every single wheel would say arrow if they just had some of each wheels sitting around. 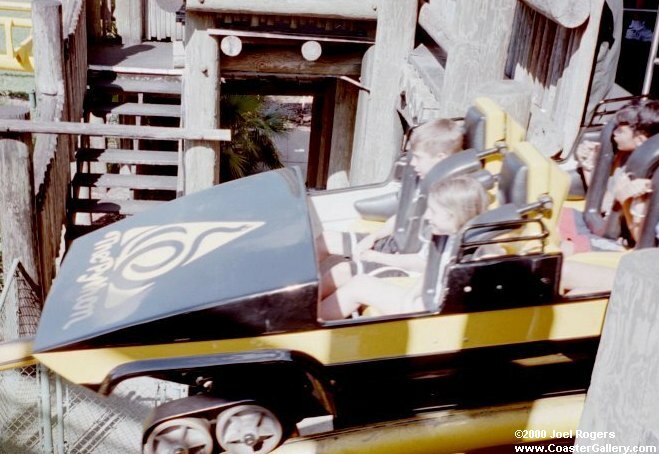 And I know I do not remember Vekoma on the back of the seats or wherever the heck you were looking. I remeber seeing Arrow on different places but not Vekoma anywhere. Maybe I am wrong but I know what I saw and what I have always been told. I have no qualms with the proposition that some smaller parts of the train could have been supplied by other companies, not even Arrow necessarily. But all of the major parts of this ride (trains included) were manufactured by Vekoma Inc. I heard that Arrow's guide wheels rest on the outside of the rail, where Vekoma's run on the inside. Check this out to verify it. Say what? Arrow guide wheels are on the inside last I checked. That's something I HEARD, I said to check on it. Anyway, it's all Vekoma, why bother argusing about it... it's a crappy coaster. I actually like the coaster. Sorry also it was somethign I HEARD that the trains on Ninja are Arrow and you seemed to cut down that pretty fast. Um... I said the trains on Ninja are Vekoma. This is Sidewinder at EG an Arrow Launched Loop. You will notice this is the exact same type of train Ninja has. COuld not find a pic of Ninja Trains. THAT Is a Vekoma Train as opposed to the trains on Ninja which are Clearly Arrow. The trains of Mind Eraser at SFWoA (a boomer) do not have a rounded front like the Vekoma trains...but a Squarish front like the Arrow trains. Not sure who made those. From what I told you, tell me who built this? Is that the Meisho Big Boom Coaster? The only doubt I have is caused by the direction the train is traveling. if it is going toward that incling, than I am positive it is the BBC, but if it coming off what looks like the first drop that I'm stumped. The look exactly alike aside from harness differences. 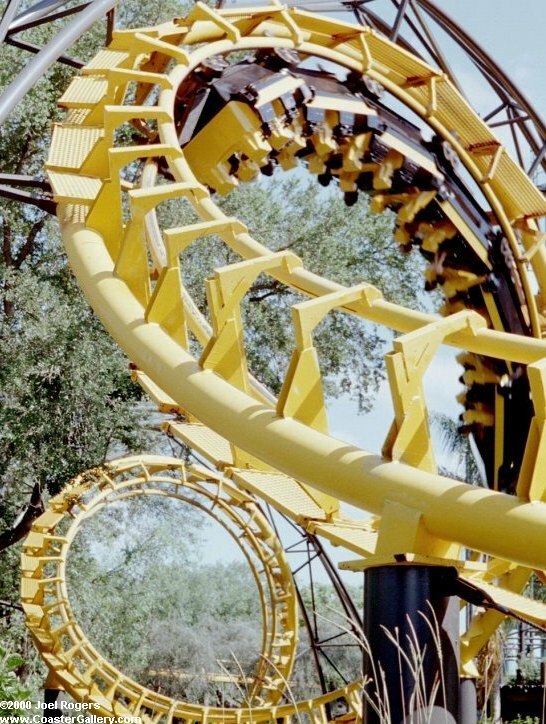 And if that is a problem, just look at Viper at SFMM. It's OTSR and body style look EXACTLY like Ninja's. If that doesn't scream Arrow I must be blind. How does the Ninja @SFSL compare? It's an older ride, & according to rcdb, has one less inversion & is much faster, 65mph.